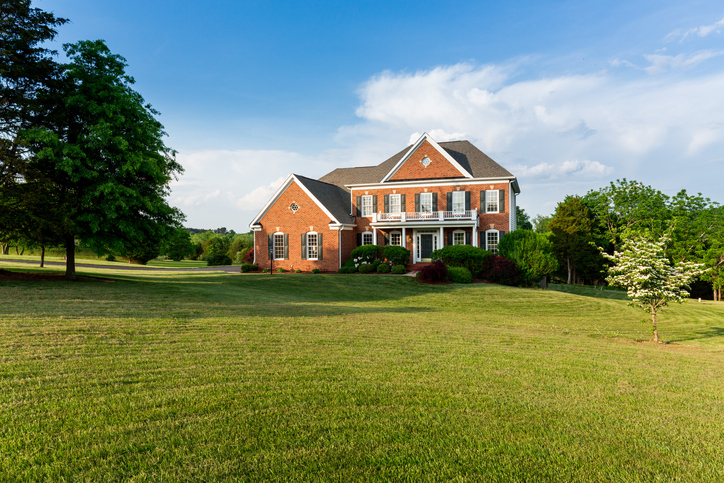 There’s nothing quite like having your own private, rolling acres of green space right outside your back door! Many of our Homes of Distinction include much, much more than just a big backyard. Explore some of the most private and lush listings that we have to offer, filled with trees and wildlife, nestled amid acres of land. Invest in your own personal refuge with this splendid estate encompassing 77 majestic acres. This stunning six-bedroom manor has everything, including a lower-level retreat with a wine cellar, a full bath with sauna, and a game room with a stone fireplace, plus all the privacy you’ll ever need! Enjoy the million-dollar views offered by this signature 198-acre property! The main residence is magnificent and immaculately maintained, and the estate even includes a guest cottage. Fields and forests, stocked fishing ponds, trails throughout, and a late-nineteenth-century, historic red barn are included. A work of art that highlights the beauty of secluded living, this property includes a stunning English Stone Tudor situated on five acres of land that you’ll never want to leave! Spend quiet weekends at the waterfall, enjoying the orchard of fruit trees, or fishing the fully stocked pond. Vale Vista is solitude reimagined, with a beautiful view of the peaceful, green valley. Situated on a private cul-de-sac, this home is the definition of elegance. With a fabulous pool, an elevator, and a gymnasium, this estate has everything you’ll ever need, plus more! The top-ticket lifestyle will be yours with this wonderful, American Postmodern house enveloped by 35 acres of land overlooking Cazenovia Creek! Mature trees and forest, meadows, and water surround this quiet, out-of-the-way residence. A sandy beach provides reprieve and relaxation. Encompassing much more than a sweeping lawn, this 16-acre property offers tranquility and solitude. Accessed via an electric gate and a 300-yard driveway, these rolling acres boast two miles of cleared bike, quad or walking trails. Find comfort, harmony, and privacy as you drive through the gated entry of this property, cross the bridge over the bubbling brook of Yellow Creek, and continue through woodlands up to this remarkable Tudor-style home. A beautiful, veneer-quality oak grove, an artesian well, and an indoor pool and spa make this estate the perfect retreat. Seven acres of peace offering breathtaking views plus three hundred feet of Huron River frontage are yours with this stately Georgian-style brick manor house. A magnificent terrace overlooks the land and the river beyond. The best part? It’s less than ten miles from downtown Ann Arbor! Situated on six breathtaking acres, this custom brick-and-stone manor in Rockledge Estates welcomes you with a circular drive and island. Fabulous amenities include a par-three golf green, multiple patios, a covered outdoor kitchen, a pool, wine room, and even a home theater by the Disney World designers of Rain Forest Café! Nestled on five scenic acres, this custom-built Cape Cod by Marc Graham exemplifies traditional charm while featuring all of today’s amenities. Relax on the patio or along the shore of your own private pond. Also included on the property is a custom-built 60’x45′ exterior building with gas, heat, electricity, and hot water. The possibilities are endless! This secluded home is perfect for anyone who loves the water. Boating and swimming are easy with 300 feet of serene lake frontage. You’ll also enjoy meticulous landscaping, a gazebo, and a nature walk! This residence boasts 12,000 stunning square feet of living area and nearly four acres of land. Want more Homes of Distinction? Read our Captivating Curb Appeal blog, or take a tour of the most Serene and Luxurious baths!